Clear Channel Airports, a brand division of Clear Channel Outdoor Americas (NYSE: CCO), and a subsidiary of iHeartMedia Inc., this week announced that it has signed a new five-year partnership with an additional five-year option with the Corpus Christi International Airport to provide state of the art advertising solutions. 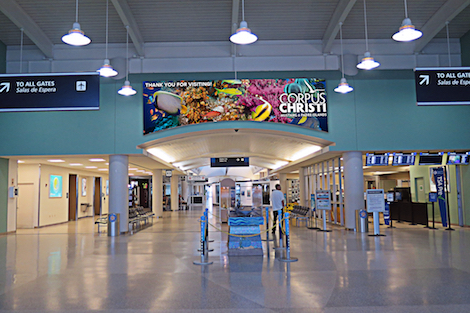 Clear Channel Airports has been the incumbent concessionaire for Corpus Christi International Airport since 2002. With the renewed partnership, Clear Channel Airports will install a dynamic program to improve the passenger experience while providing advertisers valuable coverage. Not only is Corpus Christi a popular tourist destination with its attractive beaches, marinas and museums, it’s a center for petrochemical manufacturing, large-scale fabrication, marine research and maritime shipping, making it an appealing city for national and local brands looking to reach business and leisure travelers. Locally themed elements to tie new media assets into the look and feel of the airport terminal. The latest advertising network will allow brands to reach over 675,000 annual passengers traveling to the Coastal Bend region of Texas, where tourism generates an annual economic impact of USD 1 billion. Installation of the new advertising network will be completed by July 28, 2017. This entry was posted on Thursday, June 22nd, 2017 at 17:25 @767 and is filed under DailyDOOH Update. You can follow any responses to this entry through the RSS 2.0 feed. You can leave a response, or trackback from your own site.